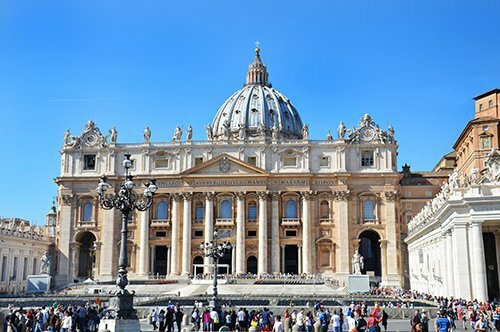 WHY VISIT THE VATICAN CITY? 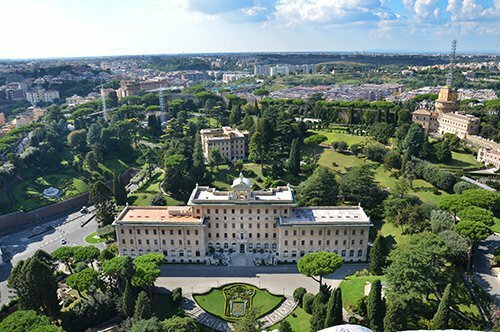 With an area of only 44 hectares, the State of the Vatican City is the smallest and most independent state in the world, both by the number of inhabitants and by the territorial extension. Its limits are the walls that surround it and, in San Pietro Square, by the travertine strip that connects the two parts of the colonnade. The Piazza di San Pietro (St. Peter’s square) is a work created in the 17th century by Bernini, has two imposing lateral colonnades composed of 284 columns of Doric order, crowned by 140 statues of saints of 3.10 meters in height and six large coats of arms. The portico and the facade were made by Carlo Maderno. Within the walls of the Vatican City are several important works of artists known throughout the world. 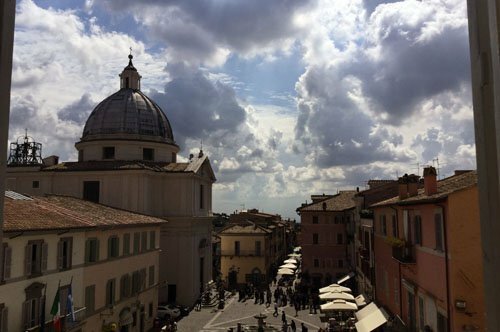 This small state includes the square and the St. Peter’s Basilica, the buildings that surround it with their artistic collections, the museums and the library, parks, gardens, streets and squares. Among the rooms of the Vatican Museums are the masterpieces of great artists such as Leonardo Da Vinci, Caravaggio, Raphael and Titian. Without leaving aside Michelangelo Buonarroti, the undisputed flag of the Italian Renaissance. Undoubtedly the main attraction is the Sistine Chapel, a masterpiece to which artists such as Perugino, Botticelli, Rosselli and Ghirlandaio have contributed. However, the most famous intervention is that of Michelangelo who decorated the vault and made the painting of the Last Judgment behind the altar. The Vatican Hill was inhabited since Roman times, developed as a suburb of the capital of the Empire and later as a necropolis. In the same place where St. Peter was murdered and buried, the circus of Nero was built later on. After the burial of St. Peter this area had an incredible development, until the emperor Constantine decided to build a basilica dedicated to the saint. However, what we currently know is a reconstruction carried out by the best artistic minds of the time, such as Michelangelo, Borromini and Bernini. Despite this, the basilica was not the main center of the Church; at that time, in fact, the Pope had his residence in the Palazzo del Quirinale, while the archbishopric of Rome was near the Basilica of San Giovanni in Laterano. The state of the Church was extended for almost a millennium by the center of Italy creating a territorial base that was annexed to the Kingdom of Italy in 1870 when the Italian army entered Rome ending the Papal State with the famous Porta Pia of September 20th, and thus marking the end of the struggle and the temporal power of the popes. From this moment until the signing of the Lateran Pacts or Lateran Accords, the pontiffs did not recognize the Italian State and considered themselves as prisoners in the palaces of the Vatican. The State of the Vatican City was born on February 11, 1929 after the signing of the Lateran Pacts between Benito Mussolini and Pietro Gasparri, respectively, representatives of the Kingdom of Italy and the Holy See. The State was constituted to assure the Holy See, as the supreme institution of the Catholic Church, with unquestionable independence and sovereignty even in the international arena. Currently the Vatican City is an autonomous and independent entity, with its own newspaper that is published in twenty languages, a radio and several television stations. WHAT IS THE VATICAN CITY NOWADAYS? The State of the Vatican City, also called Vatican City or simply the Vatican, is a city-state independent of Europe. The Vatican City is under the authority of the Pontiff of the Catholic Church, which exercises the powers of an absolute monarch, although the main actions of the government are carried out by the Secretary of State. The Vatican is the smallest sovereign state in the world by population and territorial extension. Located in the heart of Rome, the Vatican City State consists of a small territory located within the city of Rome, on the west bank of the Tiber River, on the Vatican Hill. This state is formed by the square (Piazza) and the St. Peter’s Basilica, the palaces that surround it with their artistic collections, museums, library, parks, gardens, some streets and squares that currently belong to the Artistic Heritage of Humanity (UNESCO 1072). Did you know that the military corps of the Pontifical Swiss Guard has served the papacy since January 22, 1506? In 1506, the first Swiss soldiers arrived at the request of Pope Julius II. They were considered invincible because of their strength, their noble feelings and their fidelity. Even today, the Swiss Guard deals with the vigilance, security and protection of the Pope inside the Apostolic Palace. To be part of the Swiss Guard, certain requirements are necessary, such as being between 18 and 30 years old, being a man, having served in the Swiss army and being a Catholic. It is currently the smallest professional army in the world, with around 100 soldiers. Did you know that the official language of the State of the Vatican City is Italian, while Latin is the official language of the Holy See? For this reason, the Vatican City legislation is written in Latin. Did you know that the uniform of the Swiss Guard is probably the most famous uniform in the world? It owes its existence to the commander Jules Repond (1910-1921) who designed it on the basis of Raphael’s frescoes. The colors blue and yellow belong to the coat of arms of the family (della Rovere) of Pope Julius II, founder of the Guard. The red comes from the family (Medici) of Pope Clement VII. Within the walls of the Vatican Museums there is much more than art and culture, there is also a good dose of mystery and esotericism that have followed the course of history to this day. With the help of your Vatican map, you can visit the smallest state in the world, where an immense amount of magnificent masterpieces collected over the years are located inside the Vatican Museums and in the splendid St. Peter’s Basilica. St. Peter’s Basilica: a church in the Vatican City, within the territory of Rome. It is the largest church in the world and is the largest of the papal basilicas, known as the center of the Catholicism. The Pieta of Michelangelo: a marvelous marble sculpture sculpted by Michelangelo between 1497 and 1499. With 174 cm high and 195 cm wide it is preserved in the St. Peter’s Basilica. A true work of art where we can appreciate the despair in the face of the Virgin and the suffering body of Christ. St. Peter's Square: undoubtedly one of the most famous images in the world, the colonnade of the square conveys the architectural perfection that would seem to be a kind of embrace of the Papal Rome. Sistine Chapel: a mandatory stop, one of the most famous cultural and artistic treasures of the Vatican City, is located along the route of the Vatican Museums. A chapel of a beauty that will leave you breathless. Vatican Museums: a monument of world culture and the most important museum complex in Italy. Millions of people come every year from all corners of the world to admire the works exhibited in the Vatican City. Vatican Gardens: Next to the Vatican Museums are the well-kept gardens where the Pope walks. More than half of the Vatican State is occupied by the Vatican Gardens, the place of relaxation of the popes since 1279. 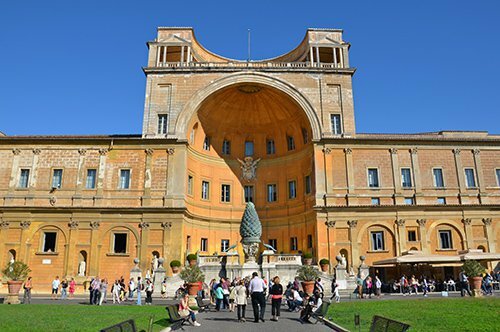 Castel Gandolfo: with the signing of the Lateran Pacts, the State of the Vatican City was granted possession of the Papal Palace and all adjoining villages, including Castel Gandolfo, which is today the summer residence of the Pope.